A rare sight indeed. Jock Hitchcock… with a BSA twin! Memories came flooding back when I read the feature ‘Triumphant lives’ about Jock and Don Hitchcock in the September edition of The Classic Motor Cycle. In the mid-1960s I worked for a specialised engineering company in Guildhall Street, Folkestone, about 100 yards along from J.A. 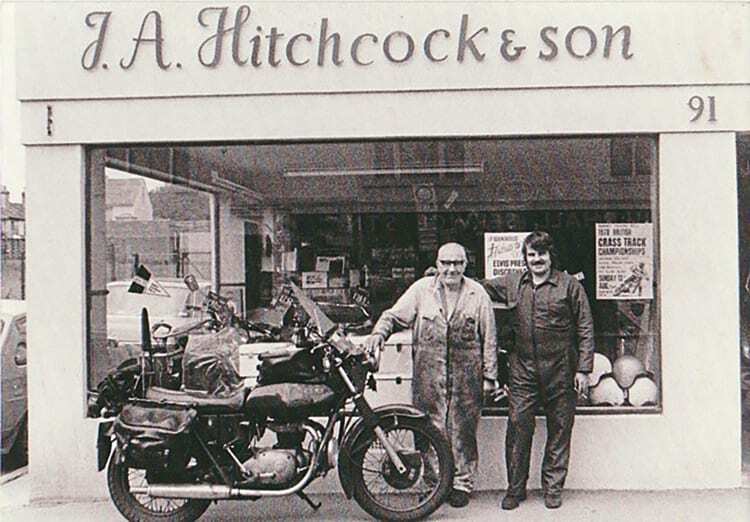 Hitchcock & Son, Triumph motorcycle dealers. Despite his reputation, it was logical I should buy my first bike from Jock and I duly took delivery of a brand-new Tiger Cub in the late summer of 1965. It was one of the last ‘all Triumph’ Cubs, as a few weeks later the Bantam Cub replacement was announced. I felt a bit miffed at the time, as I recall that it was about a fiver cheaper than the model that it replaced. The pen-picture of Jock’s personality and attitude to customers is fairly accurate by my reckoning. I recall him as a great bear of a man, always clad in a voluminous boilersuit. The shop and workshop were crammed and cluttered with stock and bike parts in such a way that it must have been difficult to find items (even a universal part for a non-Triumph owner!). It was not unusual to see Jock working on a machine on the narrow pavement outside the workshop door, presumably for lack of usable space inside. Visiting ‘Mr Hitchcock’ was not for the faint-hearted, as he could exhibit a pretty contemptuous attitude to customers, even some Triumph owners. It almost seemed as though he didn’t really want the trade, but no one doubted his expertise for the marque. Those in the know soon got to realise that usually once a week there was a trip to Meriden to load up with ‘supplies’ and new machines. Invariably Jock made the journey (quite an undertaking, given the road system at the time) in his pickup van (an Austin A55, if I remember correctly). This meant that Don would be in charge for the day. In my experience, Don was very different from his father, always cheerful, pleasant to deal with and keen to be of help. That was the day to visit! They were also Greeves dealers, no doubt due to Don’s sporting connections with the Thundersley firm. I left the area in the late 1960s, but I believe that they later became Jawa/CZ dealers. But one question remains… How on earth did Jock allow himself to be photographed with that BSA twin?